Much advice has been written on how to start blogging, on the rationale and motivation, and how to avoid common beginner's mistakes. This and this are just two examples, both including a long list of dos and don’ts. I also like the advice given by Amanda Fuller on the Kaleidoscope Blog, and her confessional "8 Things I Wish I Knew When I Started Blogging" is certainly worth reading. Research can help you benefit from the experience of others and avoid, as much as possible, mistakes which require a lot of time and energy to fix at a later stage. However, blogging is a personal adventure, and thus some of your choices are inevitable and part of your exploration; there is no escaping the trial and error process. So based on my research and my as yet short experience, I would like to summarize my current set of ever-evolving guiding precepts for my own future reference and possibly as a starting point for other potential bloggers. Write for yourself – You can find many different opinions out there: some say you need to listen to your audience; others encourage you to pay no attention to your readers and to write first and foremost for yourself. I have learned that I really like writing and that it helps me to organize my thoughts and delve deeper into my personal views, opinions and beliefs. While writing and creating my own content, I lose track of time and feel productive and vigorous. While the question of how attuned you should be to your potential readers is a good question, as far as I can see there is only one good answer: you cannot fake it in the long run. It may be disappointing if there is no traffic driving to your blog, but as long as you are true to yourself, there is no room for regrets. Follow your gut—this is my best advice not only to bloggers but to anyone who wants to pursue a creative life. Be yourself – Be genuine and personal. These are the two crucial factors in creating uniqueness; trying to be something you are not will not last for long. If you change your path in order to please others—maybe because you are comparing your blog to others or because you are looking to attract more traffic—you will lose your very essence; this is something I am not willing to do. It would counteract the reason why I chose blogging in the first place. You are the genre – Some recommend concentrating on a single topic in order to maintain your focus; others put emphasis on your own voice, whatever its cadences. In my case, I cannot but stick to my prime purpose, namely, of presenting the full picture of who I am. And so, while women’s empowerment is my primary goal, I see blogging as personal, delineating the person behind the scenes in order to reflect the full picture. I therefore choose to share my ideas and my struggles in search of self-fulfillment as well as introducing my lifestyle choices and experiences, all of which are, of course, shaped by the same prime purpose. And so, although I may lose traction in the short term, I hold firm to my main message. The "me” who started this journey is the same "me” who wants to make sure that as women we are able to combine our interests, regardless of whether we are technology- or beauty-oriented. So, I keep the fashion part of my blog, you see, not because it is a popular category or in order to reach a larger audience but because it is part of me. I am conscious of my choices, and of fashion and external appearance, and that sensibility has brought them, along with the other categories, to be part of my blog! Visualization – Many endorse including pictures in blogs; visual images let the eye rest and help to break up a long text. I know how much I too enjoy browsing through a well-designed and aesthetically-pleasing blog. Pictures do add a lot, but it is the overall appearance and atmosphere of the blog that matter more to me. If they are part of your message, then pictures can be indispensable: if you are looking to demonstrate a recipe or suggest an outfit, for example. But when it is ideas that are being discussed, no more than one or two pictures should be necessary to engage the reader. I do add photographs from my own albums, but only when the images reflect my own experience, point of view, or expression. Be creative and inspiring – I believe in inspiration as the impetus for change. I have been greatly inspired by those who have opened their hearts and minds, and likewise I believe that those for whom my writing resonates will find their way to my blog. Posting pictures I have taken is one way to be creative and unique, but this is not the essence of my blog. Pictures are a way of outsourcing words, they are part of an external reality created by the social world of photos, short messages and icons, but they can never replace our internal world: thoughts, imaginings or ideas. These can only be conveyed by descriptions and words. Be creative in how you introduce readers to your content; make it friendly, accessible and inviting in the way that you believe best builds connectivity and interaction. Short or long posts – There are all sort of views out there. For me, there is no rule of thumb; the only guideline is appreciation of the words, of the subject in question and of the time of your readers. There is no need for unnecessary elaborations—the shorter the better— unless the subject matter itself demands further emphasis and exploration. Readers interested in what you have to say will enjoy reading the long posts; if the matter under discussion is of no interest, even a short paragraph is too long. 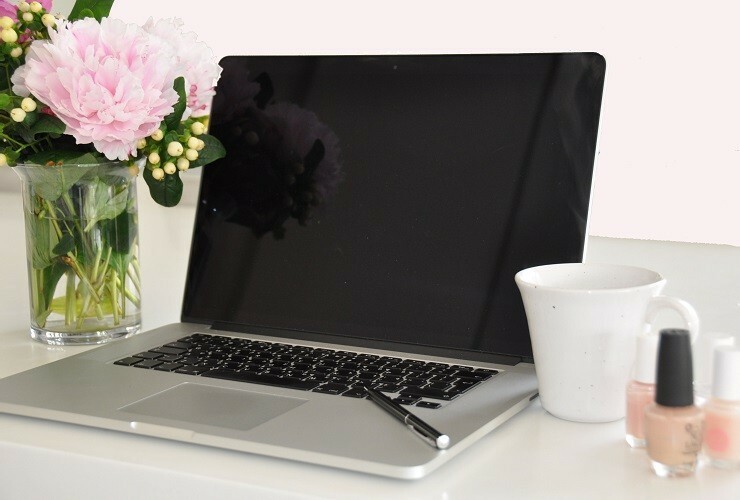 Staying cutting edge – Looking at lifestyle blogs which keep updating on a daily basis according to everyday experiences or the latest trends can be frustrating and intimidating from the point of view of a new blogger. This is an on-going debate I am still having with myself. If you are this kind of blogger, always running after the latest show or movie, then go for it! Just keep in mind that these days the most updated content comes from well-established magazines or mature blogs with financial backing and numerous resources. What keen readers are looking for is your take on the subject. Relevancy can be driven by rapid news and media updates whereby yesterday's news is old news, but also by the reader's personal state of mind, needs or search at any given time. Readers may come across your blog months after your original posting and still find it relevant, because they happen to find it just when they are looking for inspiration. Only a few loyal readers will regularly follow everything you write. So I choose to focus not on the most updated information but rather on the discussion of ideas, keeping note of timeless advice and recommendations. Remain consistent – How often should you post? Does posting every day matter? For me, consistency is a key point. Posting at least once a week should be your goal. Unless you have more to say, just adding more and more information is wasted energy, fueling only your own sense of relevancy and purpose; this, in my view, misses the point. You become obsessed with being so up-to-date with the latest trends and with the attention coming from social media .This is fine as long as you also generate new content derived from your creative need and don’t just get swept up in this constant search for new content and feedback. To start with, I have decided to post regularly 3 times a week and hope that I manage to maintain this long term. Be patient – It is still too early to say much about my own experience, but suffice to say, it is slowly sinking in that this is indeed a very drawn-out process. I hope I am able to continue enjoying what I am doing, disregarding the need for constant feedback, and that one day I will delight in the fruits of my efforts. Don’t wait – now is always better than later –The blogging experience has been evolving for quite a while now, and newcomers cannot, therefore, realistically expect an immediate audience. There are millions of bloggers out there who have been around since blogging first became mainstream over 7 years ago. However, if you have the urge, now is as good a time as any to catch up and be ready for the next technological and social change that is bound to influence the blogging industry just like any other aspect of connectivity. If you want to contribute to this discussion or ask a question, please feel free to do so in the comments below. We can all gain from your experience.